The Char-Broil electric smoker is perfect for cooking meat for a crowd. It can easily hold in a 7 lb. pork leg or even cook a 25 lb. turkey to perfection. The electric smoker sports a double walled construction. The advantage? It’s superbly insulated. The door is sealed by a latching mechanism that traps the smoke in. The temperature can be tightly controlled because the door doesn’t let out any smoke. The device has a stainless steel glass construction with a dual tone finish. It looks gorgeous enough to keep in a modern kitchen. It comes with a removable food thermometer. Users can closely monitor temperature levels to the exact degree. And obviously this electric smoker eliminates all the preparation it usually takes with a charcoal smoker. There’s no need to constantly pay attention to the wood chip boxes. This smoker supports up to three boxes of wood chips. There are also 4 adjustable racks to place food on. The large capacity smoke boxes support up to 7 hours of smoking. There are some downsides, though. If you want to refill the boxes, the only way to do so is by opening the door, which instantly causes the temperature to drop. While most parts of this electric smoker are adjustable, the vents are not. 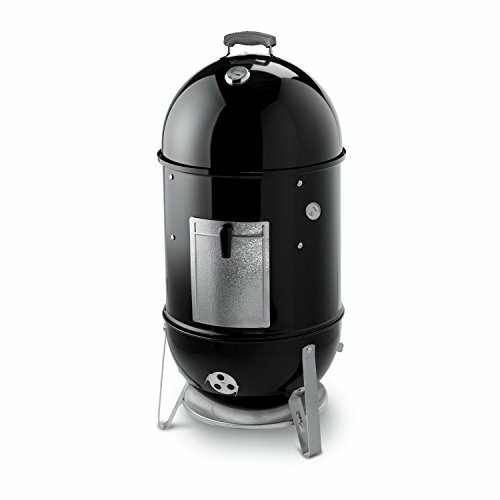 What’s the best electric smoker that can near authentically replicate the traditional charcoal smoker? Hands down, the Weber 721001. This porcelain enamel smoker is expertly designed to give off that traditional smokehouse flavor. It’s actually powered by charcoal and not wood chips. That creates the best type of smoke for the meat. This smoker is made from steel with a nylon handle. The handle is heat-resistant so you can always touch it to move the device. The gadget is powered by an alloy heat shield. It’s rust-resistant so only minimal maintenance is required. The cooking grates are nickel plated. At 481 square inches in size, these are quite large. It comes with a 10-year warranty that protects the purchase. A built-in thermometer, a water pan, storage covers, and vents with their own bowls and lids. 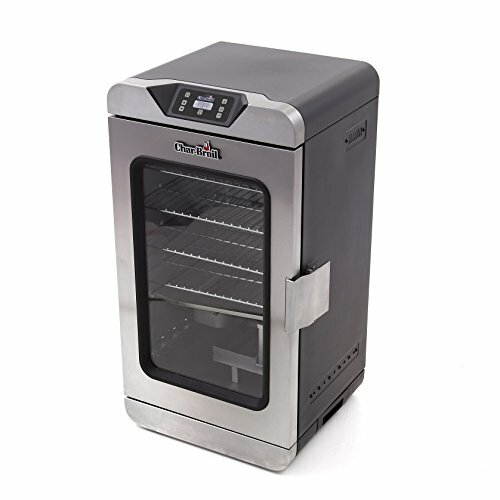 The smoker supports up to 3 cooking racks, each with its own venting system. The racks are big enough to support a whole chicken. However, the racks are not big enough to support large meat portions like a whole turkey. Another downside is that the highest temperature level is limited. It is difficult to get the smoker to reach very high heat levels. Here is an electric smoker ideally suited to the modern age. What makes this gadget so different from the rest? Bluetooth capability! That’s right; you can connect this electric smoker to an iPhone or a similar handheld device to cook remotely. The Bluetooth range is rather limited. It works up to about 20 feet and no more, so don’t expect to send the smoker a cook signal from the office. The smoker has a heavy-duty body with about 4.5 cubic feet of cooking space. The door has glass panels to check on the meat as it’s being cooked. This electric smoker has 3 cooking modes: cold, hot, and fast. You can choose the best mode for the type of meat you are cooking or heating up. The wood chip drawer is massive so constant refills are not necessary. The body includes wheels to move the smoker around as you like. The water pan is located outside. Any cook can tell you how convenient that is for cleaning and setting up the device. The cooking shelves are adjustable. The smoker has a built-in thermostat, but some cooks might require their own for getting more precise readings. This massive black box of an electric smoker looks more like a vault than a cooking gadget. But it’s perfect for smoking up classic tender charcoal meat. The massive capacity. This smoker has four shelves, which in total can hold 12 whole chickens, 4 racks of pork ribs, or 24 burgers. It’s certainly big enough for at least four Thanksgiving turkeys. In addition to meat, this smoker can fillet restaurant-worthy fish too. This smoker is fully electrical. It can work just fine without charcoal or wood chips. Users can certainly experiment with different types of wood to get the exact flavor they prefer. The smoker has a digital panel for controls such as time, temperature, and even light. The digital controls can monitor the internal temperature of meat inside. There’s no need to open the door to stick in a meat thermometer. The 30-inch body has four smoking racks inside. Each rack is chrome-coated to ensure even cooking. The wood chip loading system is located on the side. That makes it possible to reload the smoke tray without opening the door. 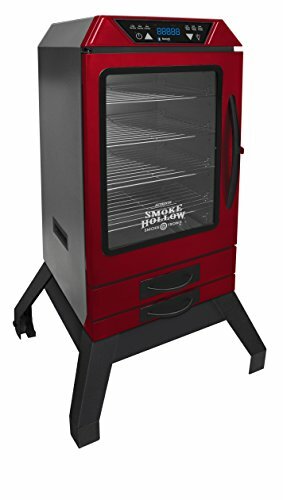 This electric smoker sports a unique shape. 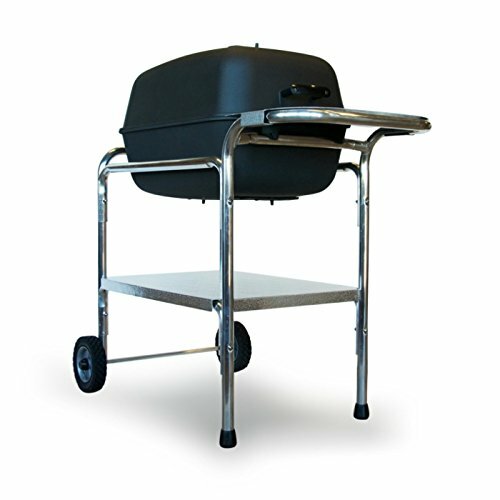 It looks a lot like a barbeque grill and is more portable compared to regular electric smokers. The atypical body is certainly sturdy, too. It’s made from rust-proof aluminum steel that can retain four times the heat as charcoal grills. This electric smoker can travel with you on camping trips. Each part is detachable for portability. It’s the perfect device to carry along on a trip thanks to the compact design. But the unique shape is not for compatibility alone. It has four vents on four different sides. It allows for easy grilling and more temperature control. The four vents can make smoking meat fast or slow depending on the selected settings. The cooking surface is 300 square inches. It’s big enough to support a turkey, but only one rack is available. While this cooks well, it lacks some of the features usually found on electric smokers, such as temperature control. This doesn’t have a built-in thermostat. The cast aluminum grill is protected with a 10-year warranty against breakage, rust, and burnout. Wood chip smokers come with compartments to load up wood chips. These smokers are great for experimenting with different types of smoking. That is to say, you can use hickory, apple, oak or any type of wood chip to get the best flavor out of the meat. These smokers generate smoke using charcoal rather than wood chips. You will get a rich, sooty taste with this type of smokers. However, the wood chip flavor will be absent here. If you want smoked chicken for dinner, then the smoker obviously has to have enough capacity to support chicken. Fortunately, most electric smokers do. It’s important to pay attention to the internal capacity. Look at the size in cubic feet and the number of racks it supports. A massive capacity electric smoker can support multiple large turkeys at once. If you are cooking for more than two people, capacity should be carefully scrutinized. The number of racks determines how many things you can start smoking at once. For example, if you want to smoke chicken, veggies and beef, you will need more than one rack. Tall smokers typically have more than two racks so you can cook multiple things at once. This is where you will load the wood chips or charcoal for smoking. The loader should be readily accessible in case you run out of material. Some smokers provide access to this compartment from the side. Meaning, you can load the compartment without opening the door of the smoker. If you do open the door, keep in mind that this would cause the internal temperature to drop, thus ruining perfectly tender meat. The internal thermostat allows you to monitor internal temperature from the outside. Some smokers even have meat thermostats to monitor the internal temperature of the meat. Nearly all electric smokers come with a thermostat. However, not all are highly accurate. Buy an electric smoker with glass panels on the door to monitor the meat as it cooks. Check out where the vents are located. This can determine how well the smoker works. Multiple cooking modes may allow you to cook fast, slow or according to a certain style. 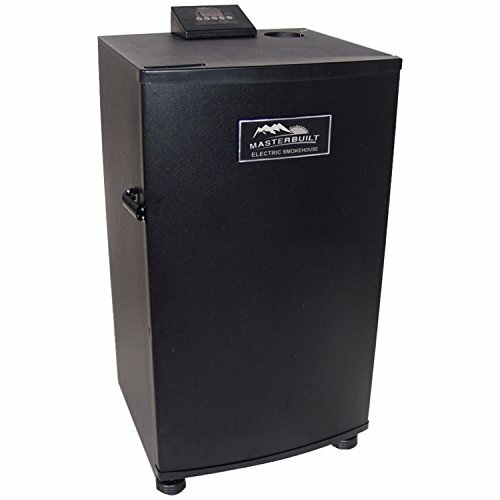 If you plan to travel with your smoker, go for a portable electric smoker. Coated racks and heat-generating parts will protect an expensive electric smoker from rusting. A warranty will protect your purchase, even if it stops working. Buying the perfect electric smoker to cook meat just right isn’t a tough task as long as you know how to choose one. Electric smokers are distinguishable by their capacity, portability, and the type of fuel used for creating the smoke, among other features. When you know what to look for, you will be able to choose the best one for your home.